As he hung naked in the basement of a government building in Damascus, waiting for the next electrocution, Ahmed said he did not realise that the woman crying and screaming in the next room was a friend. The two prisoners were activists in Homs and it was not until a year later, when they met up in Istanbul, after they were released from detention, that they figured out that they were neighbours in a Syrian torture chamber. In Turkey, Ahmed (not his real name) and his friend decided to try to get involved with helping other Syrian refugees fleeing the conflict and torture at home. During the course of their early efforts they heard of an incidence where a Syrian bride was being offered for sale by a local pimp. They later discovered the girl was 14 years old. Aid workers have warned that financial hardship, poor security and a culture of early marriage has put young Syrian women at risk of exploitation in refugees' host countries. Kilian Kleinschmidt, the head of the UN-run Zaatari camp in northern Jordan, told IBTimes UK that unscrupulous individuals took advantage of the lawlessness plaguing the camp soon after it was set up in 2012, to prey on vulnerable families. The risk of sexual violence was so great that Syrian girls and women felt unsafe using the toilets and communal kitchens. In some instances they refused to leave the tents they shared with their families, according to a 2013 Unicef report. To some of those families, marriage came to represent a safer option for their daughters. As often happens, where some see struggle others see opportunity. Foreigners, mainly men from Saudi Arabia and the Gulf states in their 50s, 60s and 70s, began focusing on Jordan in their search for a teenage bride at a cheap price. Matchmakers reportedly closed the transactions for a few thousand dollars. Kazal, an 18 year old from Homs, said she was married off to a 50-year-old man from Saudi Arabia who paid her family about $3,100. "We weren't happily married. He treated me like a servant, and didn't respect me as a wife. He was very strict with me. I'm happy that we're divorced," she told the BBC. "I agreed to it so I could help my family. When I got engaged I cried a lot. I won't get married for money again." Kleinschmidt said access to outsiders has since been restricted and security at Zaatari has greatly improved. The teenage girl market in the camp has come to an end. Safe houses and special support programmes have been set up help a number of girls who were dumped by their new husbands often after only a few weeks of marriage and who returned to the camp to find they were no longer welcome. "There is stigma attached," Kleinschmidt said. "They are not virgins anymore and this is a very traditional society. To find any compassion from somebody is difficult." The risk of early, and in some instances sham, marriages is higher in urban areas outside the camps where 80% of the Syrian refugees live. It is harder away from the camps for the agencies to monitor what is going on, said Unicef's Jordan deputy representative Michele Servadei. A daily life of hardship and struggle is routine also for the more than 700,000 Syrian refugees in Turkey, where government is leading relief efforts, allowing only a few NGOs to provide supporting roles. Lured by the prospect of work or a passage to the West, many leave the camps set up near the border and come to Istanbul. The melting pot of 14 million people located between Europe and Asia, on the two sides of the Bosphorus, is a trove of opportunities but also a window to marginalised society. Thousands of Syrian families live scattered across the city. Syrian children play ball under a spring sun in the craggy streets of historic and impoverished central neighbourhoods such as Kurtulus and Dolpdere. In Balat, in the shade of the Greek Orthodox Patriarchate, Syrian women hang clothes outside run-down buildings in which they rent basements for a few Turkish liras, turning them into a new home. In the outskirts of Basaksehir, Bagcilar and Bademlik, large families cram in small flats fitted with a few mattresses, blankets, makeshift cooking stoves and, in a few cases, a television. 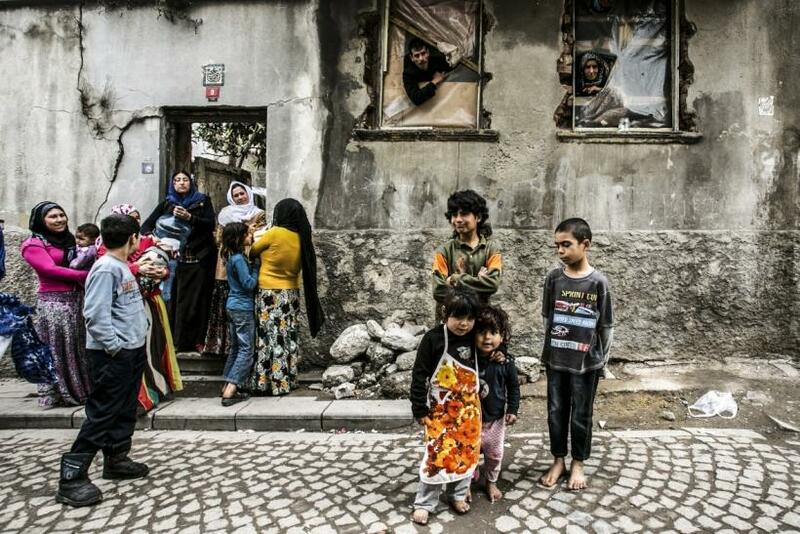 The less fortunate live in shacks and makeshift shelters in spaces carved out from Istanbul's urban mass. During the day, men are rarely home, instead engaged in the constant pursuit of work, usually as construction workers. "Most don't have a work permit and thus are easily exploited," said Elena Braghieri, an aid worker with a local NGO helping refugees. "They don't have any work insurance, work lengthy shifts, are in general underpaid and, in a few instances, don't get paid at all." Struggling to put food on the table some families ask their children to help out by working instead of going to schools they can't afford anyway. "Some kids came and told me: teacher, I can't come here anymore, my family asked me to go work with my dad because we have no money; we can't live," said Risgar Sulaiman an English teacher at a charity-funded school for refugees in the Bayramtepe suburb, north western Istanbul. Ahmed arrived in town a few months ago, after bribing his way out of jail and evading a second arrest in Homs. A computer science graduate with an MBA, Ahmed makes a living giving private lessons and applying his education on some ad hoc works he gets. Scarred by the consequences of the civil war he decided to use his spare time investigating ruthless individuals who traded on the cracks in the Syrian community torn open by hardship and poverty. On one occasion he was given the phone number of a pimp offering young Syrian prostitutes. Ahmed and members of his activist group decided to call and ask for a bride to find out how the process worked. The dealer demanded an advance of $300 (£178) to be paid via Western Union to a third party, a woman living in Hatay near the Syrian border. Efforts to track her down later proved fruitless. They forwarded the money and after three weeks the pimp called back. He demanded that the husband-to be take $2,000 to a rundown and dangerous district on the outskirts of Istanbul to see the bride and close the deal. Their attempts to move the meeting to a safer place meet without success. They then tried to arrange police backup in a bid to frame the pimp but, Amhed said, he smelled a rat and was gone. Although he was unable to prove conclusively that young brides were being sold in Turkey, the experience has left him with a bitter taste in his mouth. "I have two sisters," Ahmed said. "I don't want to see them, or any other women, treated like objects. "We faced a lot, carried dead friends and buried them. We were broke financially and witnessed a lot of violence in Syria but I would have never thought that we would reach this level -- having people dealing with our women, selling them, selling our children." Umberto Bacchi in Istanbul is the author of this article.